It started as a dairy barn in the 1920s on a farm north of Adel. By the mid-1990s, the farm was gone but the barn remained part of an acreage surrounded by new housing developments. 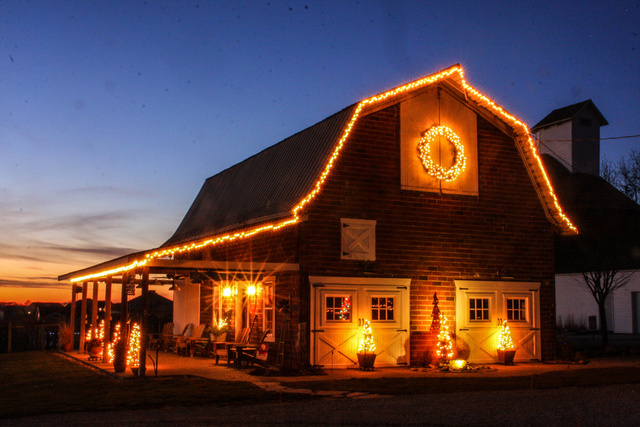 In 2006, the barn became the hub of Penoach Winery and remains a big draw at this central Iowa destination. The clay-tile barn was built on the H.B. Kinnick farm north of Adel to house dairy cattle. It was likely constructed with clay-tile blocks made in Adel. Olson recently met an 89-year-old gentleman from Arizona who is related to the Kinnick family and grew up on the farm. 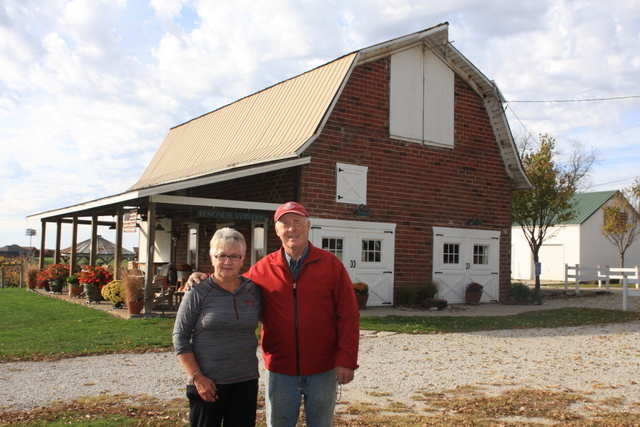 Stan Olson and his wife, Joanie, run Penoach Winery in this historic barn at their acreage north of Adel, Iowa. In 1960, Olson’s parents, Paul and Mildred Hufferd, purchased the 240-acre farm, where they raised crops, cattle and hogs. Olson moved back to her family’s farm around 1980-81 with her husband, Stan, who had grown up on a farm near Lake Mills. The couple farmed for about 15 years. “My dad raised pigs in the barn, and then Stan did, too,” Olson said. Although Stan began selling insurance after he quit farming, he never lost his passion for agriculture. “Stan missed growing things, so he planted 50 grape plants in 1999,” Olson said. In 2000, the Olsons started a grape nursery to supply grape vines to wineries that were taking root across Iowa. Within a few years, the Olsons decided to start their own vineyard and winery. Penoach Winery, which reflects Adel’s original name, opened in 2006. Today, the operation includes 4 acres of grapes behind the barn, not far from areas once covered by cornfields and a hog lot. The transformation also included new floors, electrical wiring, plumbing, windows, doors and a covered patio on the south side of the barn. “Stan did most of the work,” Olson added. 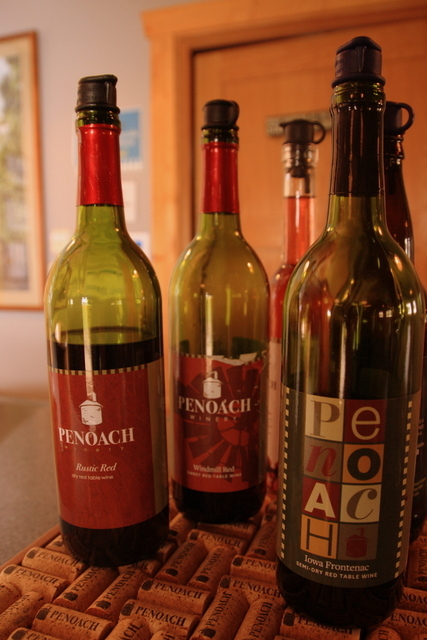 Penoach Winery offers a variety of Iowa wines produced from grapes grown on the Olson’s acreage north of Adel, Iowa. While couple installed their wine-making equipment in the back of the barn, the space wasn’t quite large enough. About four years ago, the couple moved this equipment to a nearby shed and transformed the back room of the barn into a gathering space, complete with comfortable chairs. 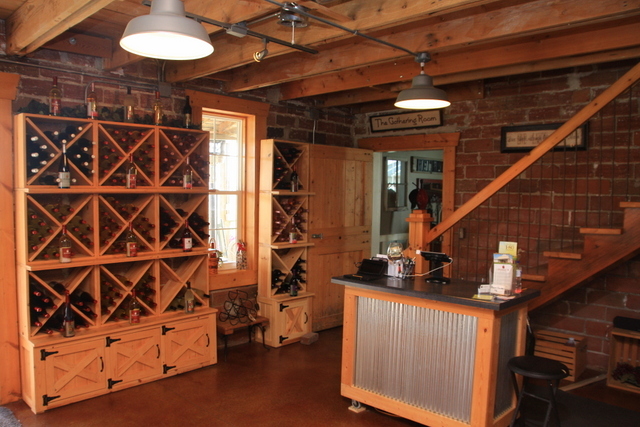 In the adjoining room, guests can browse the gift shop, which showcases 18 varieties of wine made at Penoach Winery. Want more Iowa culture and history? The barn at Penoach Winery will be featured in my upcoming book, Dallas County, a pictorial history from Arcadia Publishing, which will be released in the summer of 2017. 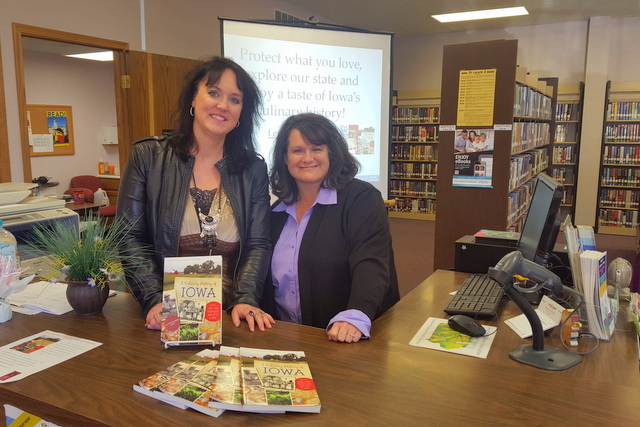 In the meantime, check out my top-selling “Calhoun County” book, which showcases the history of small-town and rural Iowa, as well as my “Culinary History of Iowa” book from The History Press. Order your signed copy today! The interior of this former dairy barn is now an inviting, relaxing place to sample Iowa wines. Is This Iowa’s Favorite Appetizer? Who would have thought pickle wraps (a.k.a. pickle roll-ups) would be the hot food topic this holiday season? 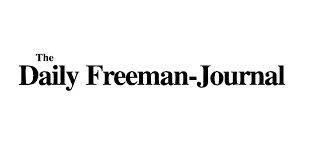 Of course, you don’t need a holiday to celebrate if you want to enjoy some “Iowa sushi,” as I explained to Des Moines Register reporter Courtney Crowder recently. My obsession with “Holiday Pickle Wraps” — also known as “Iowa Sushi” or “Lutheran Sushi” — began with a Facebook post. After living in the Hawkeye State for two years, I like to think I have at least a passing grasp on what is Iowan, but here I was simply gobsmacked by pickle wraps. What exactly are pickle wraps? Are these truly Iowan or just a quick appetizer Iowans are co-opting? And, most importantly, aren’t they incredibly salty? 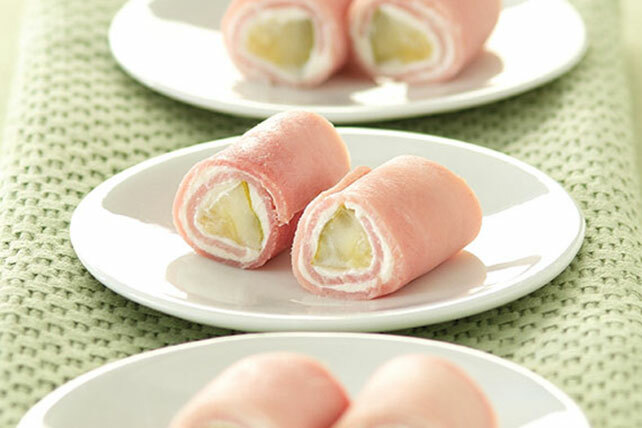 Traditionally, a pickle wrap begins with a pickle (obviously), which is then slathered in cream cheese, wrapped in ham and cut into bite-sized pieces. However, there are variations on the general pickle wrap theme, Maulsby said. Some people sheathe the ham with a tortilla and others don’t use ham at all, instead opting for a dried beef encasement. Others make pickle wrap dip, where all the indigents of a pickle wrap are blended together and served with crackers. The exact genesis of the pickle wrap — or pickle roll-up as it is also called — is unknown, but Maulsby said the appetizer most likely originated as a modification of an old-world German recipe. As with its origins, the enduring legacy of the pickle wrap is up for grabs as well. So what is it that keeps Iowans coming back to the simplest of hors d’oeuvres? The best thing about the pickle wrap is that it is soeasy to make that even I, a cooking novice, feel confident in my abilities to master the roll-up. Simply slather, wrap and cut. But Maulsby urges chefs not to rest on their pickle wrap laurels, but to attempt their own variation on the classic roll-up. Take something conventional and make it your own! Here are culinary historian Darcy Maulsby’s favorite pickle wrap and pickle wrap dip recipes. 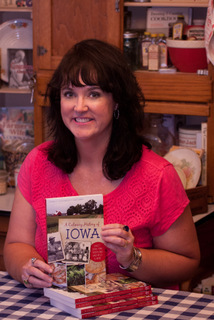 To learn more about her work and other classically Iowan foodstuffs, check out her website at Darcymaulsby.com. Lay the ham slices flat on a serving plate and pat dry. Spread with cream cheese. Place a pickle spear at one end of each slice and roll the slices into cylinders around the spears. Secure with toothpicks. Chill in refrigerator. Cut into bite-sized pieces. Mix the softened cream cheese with garlic powder (if using). Spread a thin layer of the cream cheese onto one side of a tortilla. Place 1 slice of ham over the cream cheese. Spread another layer of cream cheese over the ham. Roll a pickle up in the tortilla. Cover the roll with plastic wrap and chill for 2 hours (to make slicing easier). Remove the plastic wrap. Using a serrated knife, slice the roll into about 1-inch pieces or to desired size. Soften cream cheese and combine with remaining ingredients. Chill until serving. Serve with crackers or fresh vegetables. — Dip recipe from the Iowa Beef Industry Council.